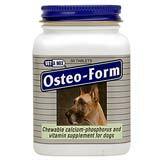 Osteo-Form Calcium-Phosphorus and Vitamin Supplement is a chewable calcium-phosphorus and vitamin supplement that aids in the prevention of dietary deficiency and also aids in the healing of fractures. The vitamins it contains - vitamins A, D, and C - are all involved in bone and cartilage metabolism. The calcium to phosphorus ratio of 1.8 to 1 aids in correcting deficiencies without providing excess phosphorus. All of the active ingredients - calcium, phosphorus, and vitamins A, D, and C - promote normal bone and cartilage health and healing.